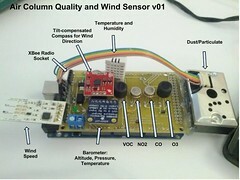 The air column monitor is currently in early phases of development. The April 2012 EcoHackII at Parsons in NYC brought together a group of developers, scientists, data visualizers and activists to work on the initial design. This tool is being developed as a partnership between Public Lab and the AirQualityEgg/Sensemakers community. Balloons and kites are a proven delivery mechanism for launching cameras (grassrootsmapping.org) and simple sensors like temperature (http://cires.colorado.edu/). Public Laboratory for Open Technology and Science and the AirQualityEgg/Sensemakers community will prototype a modular, adaptive system that incorporates a single balloon-mounted air quality sensor that can deliver real-time, altitude-specific data. The system will be able to collect vertical atmospheric profiles to shed light on phenomena such as the urban heat island and the CO2 dome. The original concept emerged from conversations with Craig Mills at the UNEP who envisioned a global mediagenic event of sensor-equipped balloons rising up across the planet. The second step of this project will build on requests from member communities facing industrial pollution. Public Laboratory has been asked to assist with developing diagnostic air quality monitors that can identify the source (according to wind direction and speed) of the particulate matter and chemicals affecting community health. This step will include the incorporation of sensors for VOC, particulate matter, metal halides, and sulfur dioxide in addition to what the Pachube Air Quality Egg project already features, namely: carbon monoxide, nitrogen oxide, temperature and humidity.